Even though the people you meet on the trail represent a wide range of ages, thru-hiking after 50 puts you in the minority. In fact, the annual Appalachian Trail thru-hiker survey shows the majority of hikers in 2018 were under 30, with a median age of 29. The AT hikers who responded to the survey ranged in ages from 18-74. Pappy was the oldest hiker to attempt the trail, proving at age 87 that you’re never too old to tackle a long distance hike. Thru-hiking isn’t just for the young, but there are certainly advantages to being youthful. One benefit of being younger is the community of peers, which I didn’t have when I attempted my thru-hike. I started on my 52nd birthday and I didn’t think much about my age at the time. Pretty soon I discovered that being 50+ could be a little lonely on the trail, especially for a woman. There were plenty of younger people and lots of older men, but ladies my age? Not so much. Where Were All My Girls? Maybe they were all still working, or home with kids and grandkids. The timing of my hike was triggered by the fact that my daughters were both out of the house, my parents were healthy, and my self-employed status allowed a sabbatical. Plus my husband was wiling to take on the responsibilities of running the household so I could go play in the woods. Not everyone my age is so fortunate. 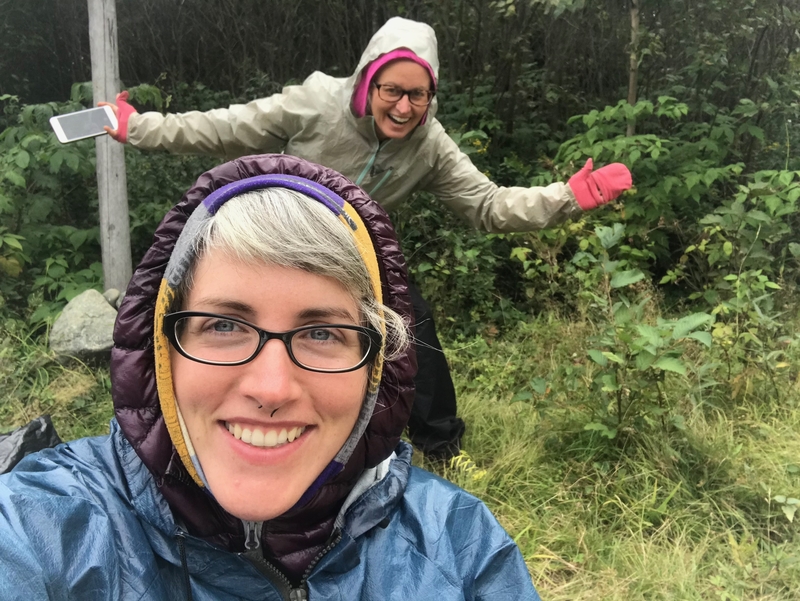 Many of the women I meet who would like to thru-hike have family obligations that keep them home. Many of men I met on the trail were recently retired and often divorced. I guess their single and untethered status made it easier to get away, although I suspect many aspiring female hikers are also afraid of, or at least are uncomfortable with, the idea of hiking alone. (I’ll tackle that issue in another post). Gender Aside, What Should Older Hikers Know? There are a number of things that making hiking after middle age a different experience than it is for the under 30 set. Some of these things are good, others are more challenging. Here’s a non-scientific look at what I observed to be the major advantages and disadvantages of hiking after 50. First and foremost, your body isn’t as young as it used to be. In my mind I’m still 25 but the calendar pegs me at more than twice that. My body enjoys reminding me of that fact, especially when I push it to hike 15 or 20 miles a day. Older hikers often face physical challenges like prior injuries and longer recovery time for new aches and pains. It’s hard to complete a thru-hike if you need to take a few days off every week, so being in shape is important. Younger hikers can easily train on the trail, starting from zero and quickly ramping up to big miles. That’s a lot harder for older hikers. Start with decent trail legs if you can. Even if you are in great shape, you may hike slower than you’d like. If you top out at two miles an hour, you can still do 20 miles days, you just have to offset slower speed with longer hours. Naturally, the prospect of falling was pretty scary for me and I slowed my pace out of caution. That hurt me in the long run, but it didn’t stop me from falling. My worst spills were on flat trails when roots jumped up to snag my foot or mud caused me to slip. Falls can lead to devastating injuries for older bodies. Carrying a SPOT, InReach, or personal locator beacon (PBL) offers peace of mind. These devices let you summon help if you get hurt or have a medical emergency. I didn’t carry one, and after hiking alone for several days toward the end of my trip, I decided it’s a piece of gear I’ll add before my next long-distance hike. Training with yoga can dramatically improve both balance and flexibility before you hit the trail, so I strongly encourage it for anyone planning a thru-hike. I also did “tent yoga” every day to stretch out sore muscles and joints. Downward Dogs turned out to be my secret weapon in combating Achilles tendonitis. Diet is especially important. Food is fuel and good fuel keeps you going longer and stronger. I struggled a bit with some traditional hiker foods, especially tuna and tortillas, but I found good alternatives like cheese, walnuts, and pretzel sticks. You might want to consider vitamins and supplements to address any nutritional deficiencies. Mail-order dehydrated food is also a good option, especially if you have dietary restrictions. It’s tempting to chow down on burgers, fries, and other greasy foods in town. (Oh yes I did!). You might also want to use town stops to load up on veggies and other healthy foods. That made a big difference for me when I starting having recurring stomach issues, which are not fun at all on the trail. Family emergencies can happen for hikers at any age, although if you having aging parents their health may be an ongoing concern as you hike. My mom was quite healthy when I left on my thru-hike, so hearing she needed heart surgery was a bit of a shock. Fortunately, I was able to get off trail to visit with her before the surgery and my brother and sister were available to help during her recovery. It’s a good idea to have a plan in place for how you’ll deal with situations that may arise while you’re hiking. If you’re an only child or would be the primary caregiver, will you get off trail? Can you line someone up in advance to check in with your family periodically and reassure you that everyone is OK? If you’ve done well in your career, you might be fortunate to have greater financial resources than younger hikers. More cash allows you to stay in town more often or pay for shuttles instead of hitchhiking. You can afford high-end gear and might even want to do a little trail magic for fellow hikers along the way. Money gives you freedom, and it’s nice to be unencumbered financially. On the flip side, your mature financial status might also mean you have lots of obligations, like a mortgage or college tuition for your kids. Unless you’re ready to sell the house and the car, some of these commitments will continue while you’re on the trail. If you can’t (or don’t want to) pay off your bills before you leave, you’ll need to arrange for payments ahead of time and check on things periodically while you’re hiking. Online banking can be a big help with that, although it’s a good idea to have someone you trust as a backup. Ask them to check your mail for unexpected bills and give them access to accounts if you think that will be necessary. Thru-hiking is as much a mental challenge as a physical one. From living with pain and dealing with rain to more subtle things (like those crazy whip-poor-wills making noise all night), mind games can be your undoing if you’re not prepared. Personally, I wasn’t ready for the feeling of inadequacy that would surface again and again as faster, younger hikers blazed by me. It took a long time for me to overcome the sense of being left behind that made me feel defeated even if I had been having an amazing day. Life experience brings with it a host of preconceived notions about how things “should” be. We learn to make snap judgments and quick decisions, which can be an asset or a disadvantage, depending on the situation. My daughters have accused me of “being judgey” sometimes and I didn’t want to bring that mind-set on my hike. I started the trail with a personal commitment to an open mind and that made a lot of difference in my attitude throughout the hike. I credit my “take everything at face value” approach for allowing me to forge unique friendships on the trail without prejudging anyone. It also helped me adjust my definition of clean, both on the trail and in some not-quite-spotless hostels. Biases go both ways and a few (not many) younger people looked right through me on the trail. It felt like they didn’t even see me because I wasn’t in their age group. That’s OK. I found friends in hikers of all ages. If I had tried to stick to my own age group, I would have missed out on getting to know some really cool people. My hiking buddy, Mud Bug, was more than 20 years younger than me, but that didn’t hurt our friendship. There are plenty of opportunity to party along the trail, and it can slow hikers down if they’re not careful. Some younger hikers get stuck in “the vortex” of party hostels and fun towns, while older hikers tend to take their thru-hikes more seriously. That doesn’t mean you can’t have fun (see Money, above). Party all you want, with whoever you want. If you choose not to, spend the time savoring the experience of trail life. I noticed a lot of younger hikers seemed to be in a big rush. Some had firm deadlines, like starting a new job or squeezing a thru-hike into a school break. Others simply wanted bragging rights for how fast they thru-hiked or how far they hiked each day. Older hikers I met didn’t approach the trail the same way. They were enjoying everything the trail had to offer, stopping for views and town visits, soaking up the experience. Tackling the trail post-retirement—or at least later in life—gives you the distinct advantage of being able to take your time. Do a flip-flop if you want seven or even eight months to hike the trail. There’s no rush. If you’re not retired, you can still be able to enjoy a more leisurely pace, if that’s your style. All in all, thru-hiking after 50 can be an amazing, life-changing experience. Don’t let age stop you. Thank you so much for sharing your experience. I will be 56 when I start my thru hike this April and I am nervous and excited. Thanks for the wonderful advice! Started my A.T. ThruHike in 2010 on April 4th at age 56. You got this! It will be the best. I think you nailed it. I can’t add anything to your perspective– I’m 58 and completed my AT Thru in 2018—good luck finishing up. What a great story! I had a similar experience later in the trail – some people were surprised to see me still hiking. They were all really supportive and it was nice to have people rooting for me on the trail as well as at home. Awesome article! I am 58 and will be starting my Flip Flop Thru Hike on April 28 starting at Harpers Ferry. Nervous? Yes. But my obsession with the AT won’t let me NOT make the attempt. Thanks, Deb. I hope you have an amazing hike! The flip flop will give you some extra time, and you’ll be starting in a wonderful area to get your trail legs as you head north. Go for it! Downward dog!!! Who knew? I need a secret weapon for one of my Achilles tendons and appreciate your sharing this tip. I am a 67 yr old hiker living in london.basically i am trying to find a go to person who can answer questions from overseas hikers that want to do the A T.
having trekked for many years i know this is my next challenge and being retired gives me that opportunity. I have watched various videos on youtube and found most very informative,but i would like more information about getting to the start to do northbound,where to buy food before hand and lots of other questions. Hi, those are great questions! From the Atlanta airport, you can get a shuttle to Amicalola Falls State Park and start with the approach trail, or go right to Springer Moutain. It’s about a two hour drive. Coming from Europe, you might want a day in town. If so, I’d suggest taking the MARTA train from the airport to the Perimeter station. There’s an REI nearby as well as grocery stores and hotels in walking distance, so it’s a good area to do your final pre-hike prep. Then you can get a ride from there to the trail. Thanks, Beekeeper. I hope you have an amazing hike! another nice thing is the camaraderie regardless of age. Everyone walks the same miles and same weather. Hi Moon Pie age 59 here hike 497 miles last summer and broke my foot. Great article I totally agree. What a great experience I will be back out there again this year. Where are the last miles you have to do? Hi Brenda, my hike turned into a hopscotch. I have a gap in MD/PA, then some shorter sections in Vermont, NH and Maine. If all goes well, I’ll wrap it up this year. Here’s hoping you stay injury free and have the time of your life! Thank you for the encouragement. I read and study and have the desire to go for it- then the reality of 52 hits and I question the possibility. I hope to hear from more “mature” hikers to share their experiences. Hi Tanja, don’t let those doubts get you – I had them, too. It turns out the AT was both the most difficult and most epic thing I’ve ever done. When I had those “I can’t do this” moments on the trail, it was wonderful to discover that I really could! If you have the time and desire, you can do it, too. Thanks you for the article. My first thru-hike in Europe was an eye opener that taught me that getting my body in shape before a hike had to take priority. I now have expanded my workout to include “leg day” everyday and supplemented my vitamins with fish oil (for joints) and doing sets of leg lunges every day so that my ligaments stay strong. I am probably in better shape than I was 30 years ago but the difference is that I don’t put “junk” in my body like I used to. Diet and exercise are definitely the key! I will turn 57 this year and am planning on two week long high altitude thru-hikes in Europe this summer. See you on a trail soon! Good information! My experiences where the same as yours. I was 51 when I hiked the AT and 61 on the PCT. Younger hikers started taking notice that I was still there, hiking right amount them. Some even asked why I was doing this probably because of my age and gender. Enjoy the journey, be empowered! Congratulations on your successful thru-hike, Moon Pie. Aspiring AT hikers shouldn’t forget section hiking as a way to get out there, especially if you’re brand new to backpacking or can’t seem to carve out sufficient time or resources. 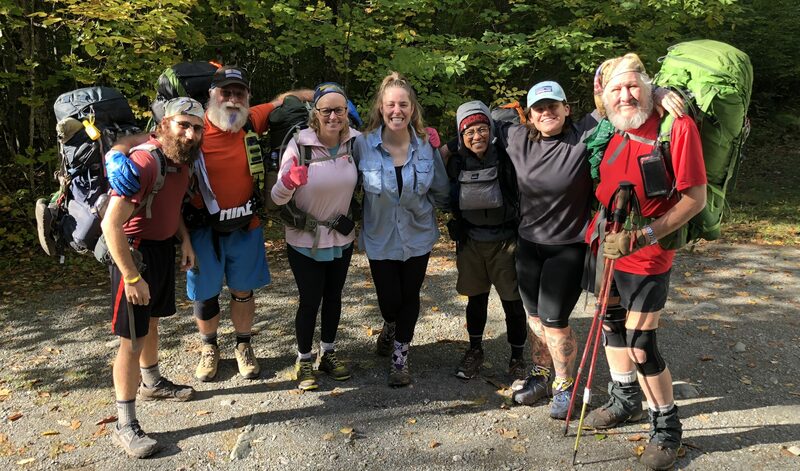 Of course, having to get your trail legs at the start of each hike becomes harder as you age, and you won’t have the same types of opportunities to socialize as you would as a thru-hiker. I started my section hikes as a 15-year old in 1973. Career and family kept my AT mileage to a minimum throughout the 80’s and 90’s, but my AT experiences were always in the back of my mind. I got serious in 2000 and hiked for a least a week from then until October 4, 2014, when I finally summited Katahdin to finish. Lots of memories, lots of pictures, lots of lessons. I’m dealing with creaky knees now, but I’m hoping to tackle the Superior Hiking Trail (in short sections) over the coming years of early retirement. Regardless, just get out there and walk! You don’t have to hike the whole trail in one piece. Section hiking takes the pressure off and lets you enjoy just being on the trail. I am in my sixties and am starting to meet more and more women in their fifties and sixties who are out there hiking the good hike. Thanks, I wish there was a “heart” button <3 here! Get out there ladies and have fun! How did my wife, Bunny Tracks and I miss you? We hiked with Mud Bug when she flipped up to Massachusetts all the way up to the Whites. We were with another couple also in their mid 50s, Bear and Sassy and picked up another 55 year old guy in the Whites, Good Chip Norris. I think we did meet briefly somewhere up north, at least I remember your name (not so easily forgotten, lol!) Mud Bug and I jumped different sections – she went to MA when I went home for my mom’s heart surgery, then I picked back up in NY. We eventually met up again at Hanover and went north from there. Great article! After more than 20 years, I started backpacking again this past year at the age of 65. Two things prompted it – my desire to get to some areas that were only accessible by backpacking and the fact that my son was regularly using the vehicle I used to transport my canoe to canoe camp. It has been both a physical and psychological challenge, but one that I have thoroughly enjoyed. One thing I discovered is that my “state of the art” equipment from more than 20 years ago no longer did the trick for me. I ended up purchasing a new backpack, hiking boots (not trail shoes because I wanted more ankle support), trekking poles (I never used them in my younger years) and most importantly moved from sleeping on the ground to hammock camping. I started with some short 2-3 10 mile RT excursions, working up to 20 mile and finally more than 32 mile trips in the Adirondacks of New York. My goal this coming year is to continue my trips in the Adirondacks and supplement those with some section hikes of the AT, which are 20-40 minutes from where I live. Hey Moon Pie. I’ve hiked 300 miles of the AT, I would love to join you if you would like a 49 year old female looking to hike. just email me. With my thru-hike of the AT quickly coming up, the thing I fear most is getting an injury. At 53, I don’t recover as quickly as I once did so even a minor injury can sideline me for a while. Injury was one of my biggest fears, too. It made me pretty cautious and slowed me down a bit, but I think trying and getting hurt is better than not trying at all. Have a wonderful trek! Thanks for representing us! I’m 53, section hiking. You reminded me of last year in VA, when the 3rd young person in a row, this one wearing an ACL brace, zipped past me while asking if I was ok. I had to laugh, thanks guys, you’re nice or I look BAD! Happy trails! Wow, thanks for sharing this! I especially appreciated your honesty about dealing with feelings of inadequacy and what caused it as well as your approach to keeping an open mind across age groups. Your genuine approach to this topic brought it to life. Thanks! I am 49 and one day I am ready to go for it, thru hike the PCT, and then the next day my fears creep in. I have been watching videos, reading blogs and looking for women my age who are out there hiking. So glad I ran across your article, thank you for your inspiration!